This piece was first published in The CEO Magazine. By Oliver Featherston. United Way has a long history of inspiring communities and organisations to get together in aid of disadvantaged communities, all across the world. In Australia, the organisation particularly focuses on smoothing the developmental path of children, particularly those who are less fortunate. Clayton Noble, CEO of United Way Australia, spoke to The CEO Magazine about United Way’s mission, how corporations can better give back and what CSR means for the corporate world. How did your career lead you to United Way? I’ve now been in three sectors: the air force first, the corporate world second, and now the third sector is not-for-profit. Throughout my career, particularly in the corporate world, I’ve done a lot of work around running backend operations, offshore operations, et cetera. I became very aware of the impact of corporate decisions on people, individuals in communities. For example, building a factory in India, or closing a factory down somewhere else, and the impact that could have. In the latter half of my corporate career, I got involved in the CSR program that existed in the corporation I worked for. I got involved with some charities, and built up my understanding and skillset of how the corporate world could help a charity. In my last decade of employment, I’ve taken the opportunity to give back in a more substantial way. Could you explain how United Way works with its partners to help local communities solve, or address, inequality? United Way has been around for 130 years globally, about 70 years in Australia. In more recent years, United Way has been involved in directly offering programs specifically around early literacy and youth transition to employment. We operate across Australia. We connect with corporates and trusts and foundations, and help funnel dollars into those areas, where it can really impact a child. The reason we do focus around the early years particularly, is because there’s just so much evidence that it all depends on what opportunities you’ve had for early education, in the first five years. It can really set somebody up for success in life. 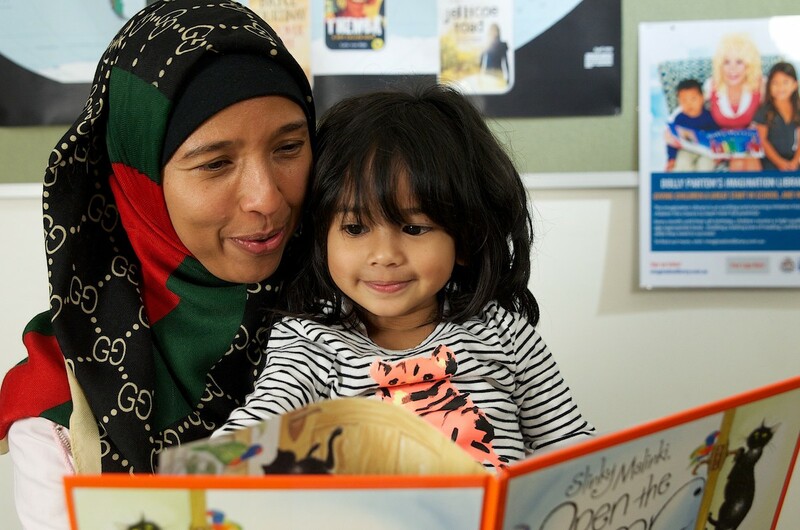 Three-year-old Shafa being read to. So you could draw a comparison between crowdfunding and what you do, but rather than a crowd, it’s companies that you’re getting together. That’s right. We’ve got over 30 corporate partners, for example, that we assist, like a trusted adviser, to help them with their corporate response and social responsibility, and work with them around how they can have the biggest impact. We get them involved in not only financial giving, but also volunteerism, and really help them with their employee engagement. Millennials really do expect organisations to offer community programs. We certainly help the corporates in their branding, but it is all going to a good cause to actually make a social impact. How do you see the role of corporations in achieving social justice, compared to say governments, or other bodies? How crucial is it for corporations to pursue social justice? Disadvantage and poverty are complex issues, and there’s no one organisation or government responsible for that. We all need to collaborate and pitch in, because in Australia, 44% of adults don’t have a literacy level, or have a literacy level that can impact their day to day activities. Corporations absolutely need to get behind finding solutions for that, because we know one in five children are going to have an issue. In many disadvantaged communities, it’s two to three children in five, and it’s going to impact their economic life. It’s imperative that corporations come on the journey and be a part of the solution. It’s not just a government problem. Certainly we help corporates understand that they can move from being just a for-profit organisation, to also becoming a profit-for-purpose organisation. In comparison to what you organise for all these companies, how do you view the effectiveness of an individual company’s initiatives, whether that’s just donations or programs? Every company that does something individually can make a difference. We’re a big supporter of companies that have a particular interest and we help them along that particular line. Where we find the most exciting work is where we see a group of companies wanting to collaborate. When they’ve come up with a combined approach, they’re able to multiply their effectiveness and their impact. 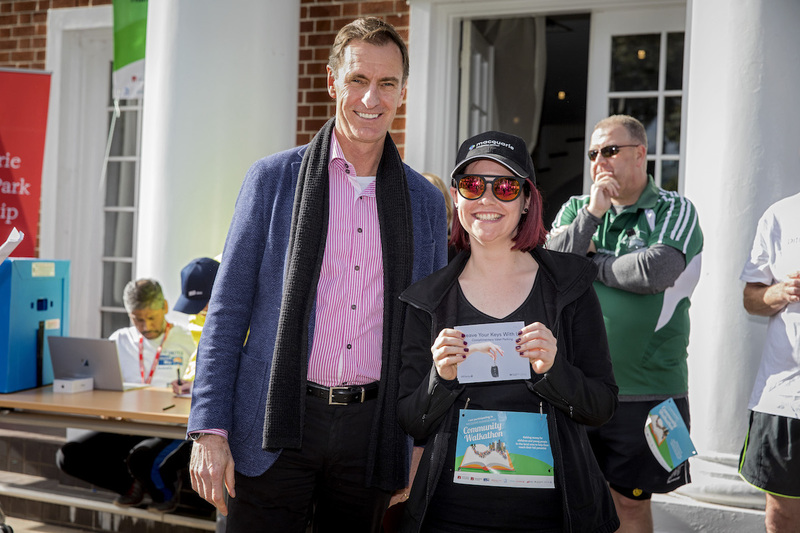 Clayton Noble at United Way’s Macquarie Park Community Walkathon. Obviously CSR, in recent history, has become a more deeply ingrained concept in corporate culture. Have there been any challenges or difficulties involved in this movement? I think CSR has significantly matured from even 10 years ago. As I said, millennials and the workforce of today absolutely expect mature CSR programs to exist in corporations. We can see that the flow-on effect of that when corporations are willing to really take ownership and responsibility and provide opportunities for giving and volunteering. I’m very buoyed by the fact that more and more organisations are getting involved. I come across very few organisations today that don’t do something, and all of them are wanting to do more. Aside from signing up to these collective efforts, what other tips would you have for companies do to improve their ability to give back to the community? I would say, first and foremost, make sure the CSR program is on the agenda of the board and senior leadership team, inculcated into the internal business management systems. Think carefully about the cause. What is the cause that the organisation really wants to get behind? Some corporations support hundreds of different things, and others say, “Well, let’s focus our efforts around a few”. Having that conversation is critical. Aligning the cause to some of the values of the organisation and the competencies of the organisation is a good thing as well. I think greater societal impact and engagement can happen when there is alignment of values between the corporation and who it’s trying to help.